Suhre K, Raffler J, Kastenmüller G., Biochemical insights from population studies with genetics and metabolomics, Archives of Biochemistry & Biophysics . Over one hundred fifty years of biochemical and molecular biology experimentation uncovered the function and substrate specificity of many enzymes in organisms ranging from microbes to humans. This knowledge, generated by generations of biochemists and molecular biologists, fills today’s reference volumes on biochemistry. Metabolomics combined with high-throughput genotyping, and applied in epidemiological studies, are now generating biochemical hypotheses at a large scale by analyzing the influences of genetic variation on metabolic phenotypes in genome-wide association studies (mGWAS). In this review paper we present recent findings from population-based genome-wide association studies with metabolomics, with the objective to make these results more readily accessible to biochemists and molecular biologists. Example for a genetically influenced metabotype (GIM). Fatty acid desaturase 1 (FADS1) catalyzes the desaturation of dihomolinolenoyl-CoA to arachidonoyl-CoA (C20:3 to C20:4). 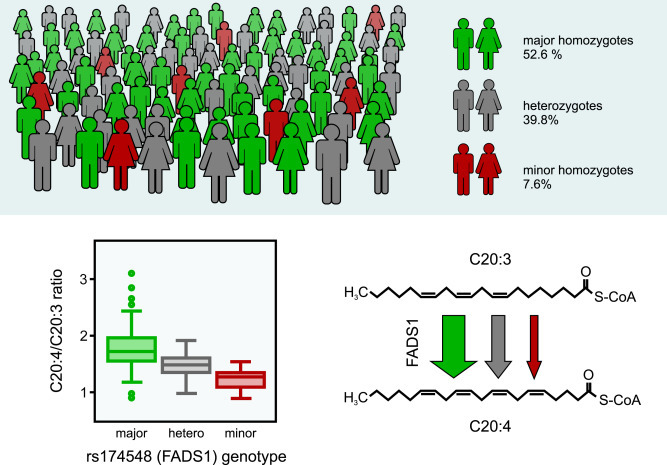 An mGWAS revealed significant associations of SNP rs174548 (located within the FADS1 gene locus) with ratios between lipids (mainly glycerophospholipids) containing C20:3 and C20:4 fatty acid chains. The results indicate that individuals with one or two copies of the minor allele (minor heterozygotes and minor homozygotes) convert C20:3 to C20:4 less efficiently as compared to major homozygotes. The minor allele frequency of rs174548 is 27.5%. Thus, interpreting the product/substrate ratio C20:4/C20:3 as proxy for the conversion rate of the desaturation, the metabolic efficacy of this reaction is about 50% higher in homozygous carriers of the major allele (52.6% of the population) as compared to homozygous carriers of the minor allele (7.6% of the population). Source: Suhre K, Raffler J, Kastenmüller G., Biochemical insights from population studies with genetics and metabolomics, Archives of Biochemistry & Biophysics, 589:168-176, 2016.